Funky pair of funny jumbo size bare foot shoe covers. Flesh color adult size latex feet can be used to with a number of costumes. Pair it with a Caveman, Flintstones, Crazy Barefooted Clown, Ogre, Giant, Hobbit style Frodo or Bilbo Baggins Costumes. Add some paint or hairy fur to give a more authentic look! Perfect for fairytale prop building or various unique crafts projects for the next cosplay convention. Heavyweight Latex Rubber stretch to fit over shoes up to adult men US size *10. Includes one pair of One size stretch that slip right on to cover your shoes. 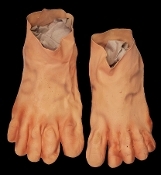 One size fits most adults Jumbo Bare Fairytale Ogre Caveman Hobbit Feet Shoe Covers costume accessory.